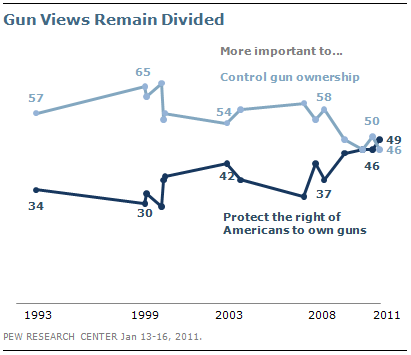 In the wake of the Tucson shootings, there is no significant change in public views on the issue of gun control and gun rights. Currently, 49% of Americans say it is more important to protect the right of Americans to own guns, while 46% say it is more important to control gun ownership. In September 2010, 50% prioritized gun control, 46% gun rights. In this regard, there is no sign that the longer trend toward an emphasis on gun owners’ rights has abated. The issue remains a deeply divisive one along party lines — by a 72%-to-22% margin Republicans say protecting gun rights is more important, while by a 70%-to-26% margin Democrats prioritize gun control. Independents are more divided, with 52% favoring gun rights and 44% gun control. For a comprehensive look at opinions on the gun issue, see “Views of Gun Control — A Detailed Demographic Breakdown,” Jan. 13. Perhaps one reason that attitudes remained stable was how few saw the events in Tucson as a sign of broader social problems. Most (58%) Americans say things like this are just the isolated acts of troubled individuals. 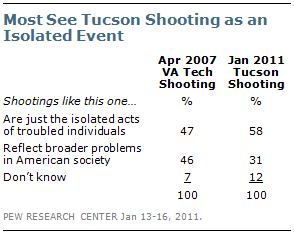 Only about half as many (31%) saw the shooting in Tucson as a reflection of broader problems in American society. By comparison, Americans were more likely to see broader problems behind the Virginia Tech shootings nearly four years ago — at that time, 46% thought the tragic events reflected broader societal problems. Those who see broader social problems behind the shooting offer a variety of explanations. When asked to describe, in their own words, what the tragedy reflects in society, 27% point to problems in the social climate, such as the breakdown of society, the way children are raised, a lack of civility, respect, discipline and a general move away from religion, God and morality. But nearly as many (21%) believe that the shooting reflected problems in the political and media environment, such as political divisiveness and the impression that so many people are deeply unhappy with government these days. 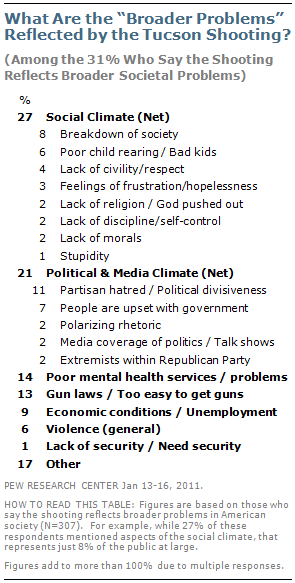 Another 14% of those who see the Tucson shooting as reflective of broader social problems specifically mentioned problems in the mental health system, and 13% referred to weak gun laws that make it too easy for people to get guns. Slightly fewer (9%) described economic stress and unemployment as factors behind the shooting.